With any water sport or outdoor pursuit, you run the risk of ending up with wet gear. A tumble, sudden wave, or unexpected rain can damage valuable gear and make for uncomfortable travels. 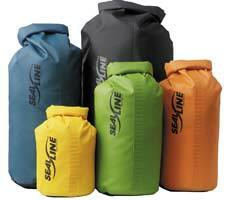 Protect your gear from the elements with the extensive range available from SealLine. There are packs, duffels, vinyl and nylon dry-bags, and plenty of accessories for anywhere you may get wet! All built to last, with the SealLine lifetime warranty. Identified by a pair of black double sealing vinyl strips, our exclusive Dry Seal closure is more effective than any other roll-down closure. With RF Technology, molecules in the dry bag material are agitated to the point where they bond with one another at the molecular level. Proven on rivers, lakes, and oceans around the world. Made with durable 20 ounce vinyl to resist punctures and abrasion, with reinforced bottoms made with extra-thick 34 ounce vinyl.